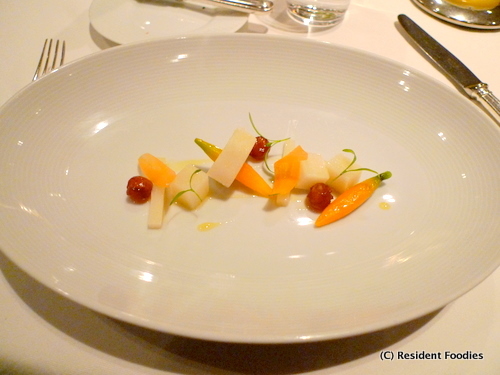 Resident Foodies say: Our biggest disappointment this year came, much to our surprise, when we visited The French Laundry in Yountville, California. Owned by Thomas Keller, one of the best chefs in America, The French Laundry is supposed to be one of the best restaurants in the U.S., if not the entire world. Michelin awarded The French Laundry a rare 3 stars — something that no other restaurant in the food-obsessed Bay Area attained this year. In a recent Food Network poll, chefs around the U.S. most often picked The French Laundry as the best restaurant in the U.S.
We love Thomas Keller’s Ad Hoc restaurant right down the street, so we all were anticipating a quite enjoyable meal at The French Laundry. Unfortunately, that’s not what we got. Far from it. The meal was, sad to say, downright forgettable. So much so that we don’t recommend this restaurant — a first in the short history of our blog. So what went wrong? : First off, even though The French Laundry takes only a very limited number of people each night, the kitchen was really backed up. We were seated at 7:30 p.m. in a very warm, somewhat uncomfortable center room and didn’t see one morsel of food–not even bread–until after 8:30 p.m. Where else would you ever tolerate waiting for 1 hour at your table without any food? The restaurant was full that night, so our guess is that the kitchen got really behind and then started rushing to get plates out after people had to wait for more than 1 hour. But we shouldn’t have to make up excuses for the restaurant. Whatever the reason, the slow service really got our night at The French Laundry off to a very rough start. 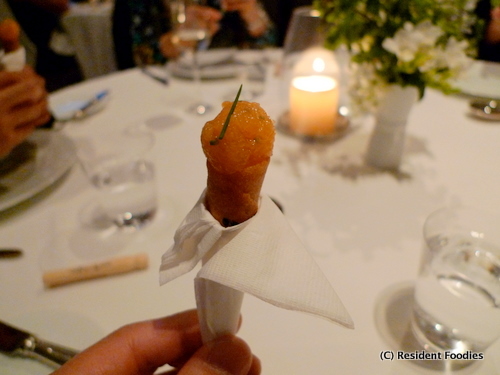 But then we thought the night would rebound after we tried The French Laundry’s famed salmon tartar coronets, pseudo ice cream cones. These were delicious and whetted our appetite. 1. 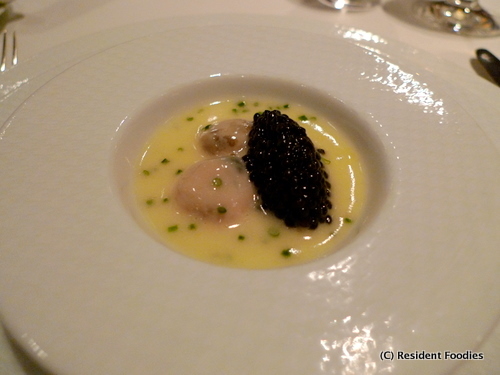 Our first course was also very good — the famed “oysters and pearls,” sabayon of pearl tapioca with Island Creek oysters and white sturgeon caviar. A good start! 2. Our second course — salad of Hawaiian hearts of palm (nantes carrots, medjool dates, cilantro shoots and madras curry gastrique) — was good, but pretty basic, as you can tell from the photo. So-so. 3. 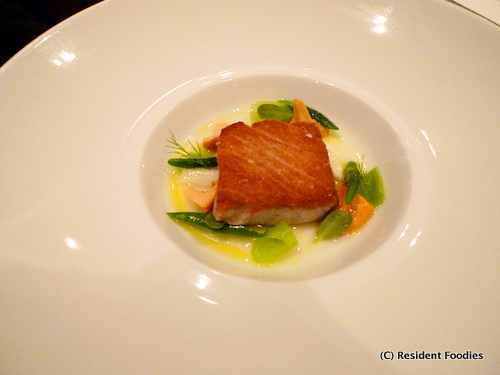 We did enjoy our third course — sauteed fillet of Atlantic halibut . It wasn’t the best halibut dish we’ve had, but it was still a decent dish. 4. The night came to a screeching halt, however, on the fourth course. The dish was so forgettable we actually forgot what’s it called. 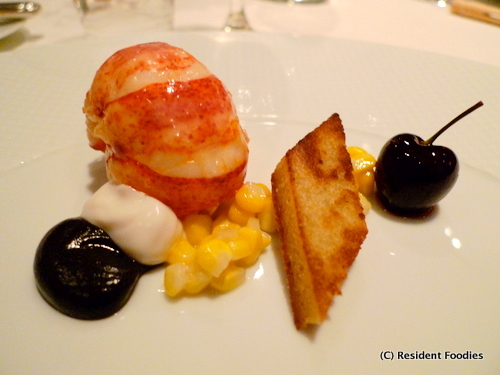 Throw lobster, corn, cherry, and bread on a plate, and you get a mess. To make matters worse, the lobster was overcooked and chewy. As Tom Colicchio of Top Chef would say, the dish didn’t work. The ingredients were random. There was no execution. Overcooked lobster ruined the dish. Without a doubt, this was the worst dish of the night. UPDATE: We were told that we ate at the French Laundry during the transition period after Chef de Cuisine Corey Lee left to start his own restaurant Benu. A person in the know suggested that the kitchen probably was still working out all the kinks when we dined there. That helps explain why our meal was so bad, and the service so slow.